So a fairly boring blog post perhaps on gloves. It’s very rare that you’ll catch me out on a bike without wearing gloves. Not 100% why but I also think it’s better to wear gloves as if I come off the bike, the first part of my body that I’ll move to try and stop myself probably is my hands. And considering I use them everyday, I kind of want them to not be to damaged. Anyhow, summer gloves are never really an issue for me - I have a fairly old (and by now, pretty tatty) pair of Fox gloves but these are to thin for winter riding. I bought a pair of gloves (can’t recall the brand name now) at the London cycle show last year and they weren’t to bad. However, during windy days, or just fast downhill descents, wind would just tear through these and make it feel like you were wearing nothing at all. They did come with a rain cover type cover that was attached near the wrist of the glove and would unroll and cover your hand like a mitten. Nice idea (as these were also reflective, ideal for commuting). The major downside was that they were a bit small and really restricted your handling of the bike so I ended up never using those “flaps”. When they ended up getting a hole in last month, I didn’t think it was worth fixing and decided to buy a new pair. 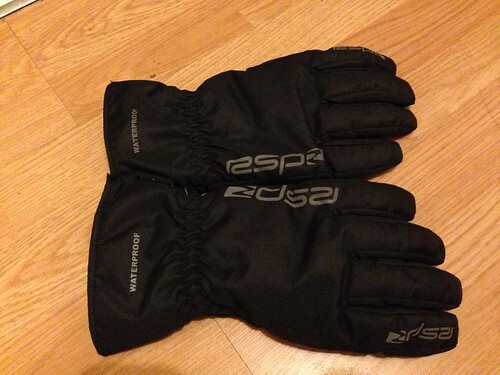 Anyhow, so along I went to the local bike shop and bought a no name pair of gloves. Waterproof, windproof, the lot. They’re pretty warm and do the trick of keeping the wind out. Waterproof seems to be fairly good as well by can’t comment to much as I’ve not worn them in the rain much (I barely rode at the end of last year). However, I’ve got a big issue with them and that’s the sheer bulk of the glove. With the gloves on, I can’t attach my lights, I can’t even open the garage door to get the bike out! And then when I’m on the commuter bike, I’m just about able to operate the gears - I’d hate to ride the road bike with these, there’s almost no chance I’d be able to operate the gears nicely with these! It looked like I was doomed to having fat finger syndrome or hypothermia in my hands! That is, until I was in Go Outdoors over Christmas. Now I’m a big fan of Go Outdoors (in fact, I love all outdoor shops). 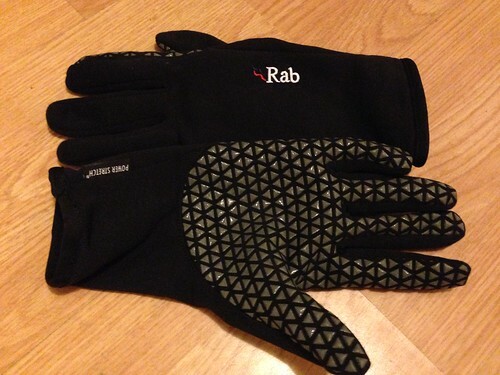 I was browsing the gloves and stumbled upon the Rab Powerstretch gloves. 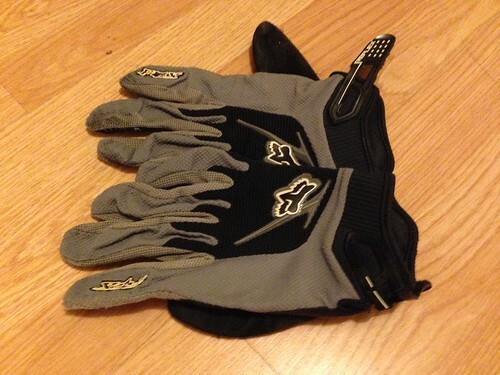 These seemed almost ideal for cycling, even though they aren’t cycling specific gloves. Maybe thats where I was going wrong, only looking at the specific ones, when I should have been looking at all gloves. Whilst these aren’t waterproof, having worn them in a torrential downpour, I can say that it takes a while for the water to soak through. In addition, they aren’t pretty windproof - not so much as the thick gloves above, but they do a pretty good job at keeping the biting cold air out. Which, after all, is the main reason I got them. Thankfully as well, they don’t give me fat finger syndrome. I can happily operate all the parts of my bike with them on and I can even fiddle with my Garmin cycle computer. So that’s a plus. They are missing the ever helpful terrycloth on the thumb for nose wiping (espcially helpful in the colder weather!) but I can miss out on that for having warm hands that I can actually use for operating the bike comfortably!